1. Had the chick been knocked from the nest during the storm? 2. Had the male evicted and killed the chick? 3. Why was he ripping the nest apart? 4. Is this normal behavior? I would think that the chick did fall out during the storm - once on the ground, it would die very quickly from exposure to the storm. Out of interest, the male does not roost in a nest with eggs or chicks. The female sleeps in the nest with her eggs and chicks, although I'm not sure if she stays in the nest the last day or two before the (large) chicks fledge. It is normal for males to break down nests that females have not accepted or nests where breeding has been completed. It is interesting that the male broke the nest down so quickly, rather than waiting a few days. Females do not relay in the same nest but will choose a new green nest, either in the same colony or in a different colony. Males break old nests down so that they can build a new green nest in its place and try to attract a female to that. See breeding records for Southern Masked Weavers here. The Sociable Weaver has a remarkable communal nest built of dry grass. If this species built its nest in high rainfall areas, their nests would become water-logged and quickly disintegrate. 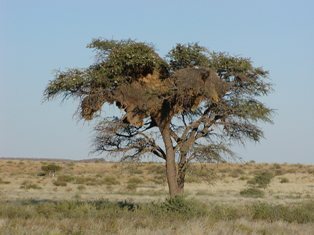 Arid areas can experience heavy showers on rare occasions but usually the Sociable Weaver nests have plenty of opportunity to dry out. Sociable Weavers do need some rain and slightly higher rainfall can result in a longer breeding season, higher clutch size, and greater fledging success. To see the global distribution of the Sociable Weaver, see the atlas text here and PHOWN breeding records here. Individual Southern Masked Weaver males vary widely in how large their colonies are. In a study at the CSIR in Pretoria, I found one male who always had more than 10 nests in his colony, while another male had only 1 or 2 nests. The latter male may have been an inexperienced, young male. Anyway, he would build a nest and a few days later break it down again. When a female arrives at a colony, the male displays from his nests (especially the newest nest). Either the female will accept it or she will leave and look elsewhere. Females do not destroy nests. Males build new nests with green vegetation. The nest material fades after a few days to a brown colour, and then a female passing by does not know how old the nest is - usually a female chooses a newish nest. The male may leave a brown nest to hang for a long time or may break it down to build a new nest in the same place. To break a nest down, a male shreds it with his bill and the nest material falls to the ground or is blown away by the wind. A male can break a nest in half an hour although sometimes he will take longer breaks inbetween breaking it down. Rarely a male will snip the twig off, but then the nest should be lying on the ground below the colony. A strange nest. There are always surprises in the bird world! 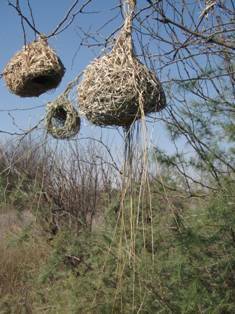 I finished a CWAC at a farm dam between Bultfontein and Wesselsbron at c.10h00 on 12 August 2009 and was going back to my bakkie when I noticed a male Masked Weaver busy with a nest which had long “strands” dangling from it. I had a closer look and found that one of the two completed nests next to it had even more of these strands, which I decided were stalks of species of sedge growing below and around the nest tree (c.5 m from the water’s edge). From their position it seems as though they were used in the initial “foundation ring” (probably because there was not much in the way of green grass around) and, because of their length and rigidity, the bird had difficulty weaving them into a circle. There seem to be some of these stems in the third nest, but where they have been used more successfully. Have you ever come across this? This is interesting! I have not seen strands hanging so far from a Southern Masked Weaver nest before. Immature males often build untidy practice nests, but even these nests don't have strands hanging as far as in the case recorded by Brian. This is an example of localized leucism. Albinism in birds is the complete lack of pigmentation from the feathers and eyes, while leucism is the absence or reduction of pigments in the feathers. More common than a complete absence of pigment cells is localized or incomplete leucism, resulting in irregular patches of white in a bird that otherwise has normal colours. The Dark-backed Weaver, or Forest Weaver, Ploceus bicolor occurs as far west as 24° 30'E (Harrison et al. 1997) and thus Cape St Francis, Eastern Cape, is within the range of this species. There are reports of this species at Nature's Valley, Western Cape (Every 1975, Hockey et al. 2005), about 86km west of the easternmost record of Harrison et al. (1997). The call of the Dark-backed Weaver is distinctive, although this species does have slight variations (local dialects) across its range. 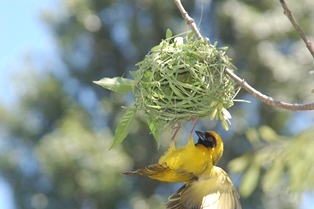 The nest photo you sent is not of a Dark-backed Weaver. Two species of weavers in southern Africa can have long entrance tubes, the Dark-backed Weaver and the Spectacled Weaver Ploceus ocularius, which also occurs in the Cape St Francis area. 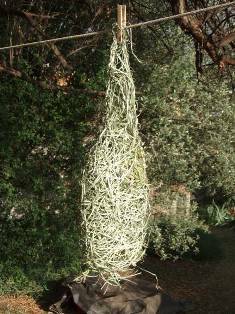 Dark-backed Weaver nests are made of vines and twigs while Spectacled Weaver nests are constructed of leaf and grass blades. 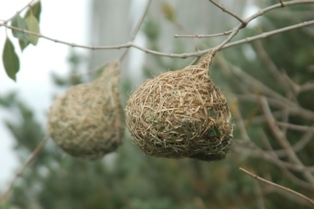 Also the nest of the Dark-backed Weaver tends to hang at a slight angle rather than straight down. In summary, you probably heard a Dark-backed Weaver at Cape St Francis, but found the nest of a Spectacled Weaver. Cape Weavers usually desert their breeding colonies during winter and wander in foraging flocks which roost communally in reeds at night. Rarely I've found an individual Cape Weaver that does sleep in a nest in an inactive colony at night. This may happen more often as spring approaches and the weavers start getting ready to breed. Skead (1947) noted the same, i.e. that single birds sometimes roosted in nests during winter while the majority roosted in reeds at a dam nearby. In Southern Masked Weavers during the breeding season, the males and breeding females will usually sleep in a nest, but if a male is disturbed in the early evening, he may sleep on a nearby branch. The same probably applies to Cape Weavers. Rowan (1983) studied the literature and Nest Record Cards and found the following under Diederick Cuckoo: (p362-363) "Another perplexing case is the Red Bishop. It is a major host in Natal, the Transvaal and Zimbabwe, but has never been reported in this category in the Cape, although it is a common bird over much of the province, with a breeding season that overlaps that of the cuckoo. Possibly the Red Bishop gens of the Didric Cuckoo does not occur so far south." Hockey et al. (1989) list four main hosts in the SW Cape as Southern Red Bishop, Cape Sparrow, Cape Weaver and Southern Masked Weaver. These are the main hosts in southern Africa, so the authors have applied this to the SW Cape. So what are the main hosts of the Diederick Cuckoo in the Western Cape? There have been few breeding studies of the 4 main hosts in the SW Cape. Schmidt (1968) studied Southern Red Bishops and Elliott (1973) the Cape Weaver, but neither reported brood parasitism. The Southern Masked expanded its range into the Western Cape over the last century and is not likely to be a host to the cuckoo in the SW Cape. A quick glance at the Nest Record Cards shows one record with Cape Sparrow as the host (in Mowbray in 1980). The most likely hosts in the SW Cape are the Cape Sparrow and Cape Weaver (although there seem to be no positive records of the latter).